The black comedy Weekend at Bernie’s was the story of two young insurance agents whose boss dies. For a variety of reasons, all related to the agents’ short-sightedness, stupidity or naked opportunism, they have to pretend he is alive, at a party hosted by him, for the rest of the weekend. The outcome of the current political shitshow in the USA, to be decided in November, may be that Hillary Clinton becomes President. If this happens – and at the moment the outcome is only paying $1.31 on BetFair – then she will assume the Presidency at the age of 69. In all of American history, only Ronald Reagan was that old when he became the President. This is bad because Ronald Reagan was crippled by Alzheimer’s by the middle of his tenure, and was basically brain dead by the end of it. 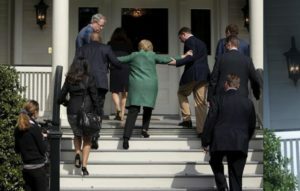 Hillary Clinton’s physical health is not believed to be the best, as is suggested by the attached image of Clinton’s assistants helping her stand and negotiate a set of stairs. She is widely thought to be an alcoholic, which, to be fair, is common of political types. As for Clinton’s mental health, let the following clip – in which she talks about the Libyan leader Muammar Gaddafi, who was sodomised to death with a knife after a US-led invasion not long after announcing plans to expand a billion-dollar national engineering project that was not funded by borrowing from international banks – summarise her personality. Hillary is clearly not a woman in good health. 69-year old alcoholics don’t tend to live much longer, and there is a very real chance that Hillary will die on the job. Would the Establishment let Hillary simply die? Or would they, in preference to the instability created by a change in leader, keep Hillary Clinton’s body alive? It ought to be possible to hollow a person’s body out and replace the bones and muscles with a robotic endoskeleton, which, when combined with modern audio technology and AI controlling for realistic facial expressions, could create a realistic imitation of a human being, especially when viewed through a television. Those of us out here in meatspace now have to contend with the very real possibility that the US President is some kind of android, and will simply do and say what it is programmed to do by unseen handlers. The suppliant mainstream media will naturally go along with this, as the few of them with the wit to see through it will be paid off like the whores they are. Next Next post: Could the Black Caps Run a Four Man Pace Battery?